So far in our “Your Annual Report” series we have explored why you need an annual report and how to make the decision between Print and Digital reports. In this installment, we are diving into tips for what should be in yours! Every organization, church, and missionary is unique – and honestly many of the donors who give major gifts are receiving several annual reports every year – so yours should reflect your story and brand. There are no cookie-cutter reports, but hopefully, these tips will give you a great place to start. As always, Echo Your Story is passionate about working with nonprofits, missionaries and Churches to design and develop annual reports that tell your story and engage donors. We would love to help you design yours! Have you ever noticed that most magazines you read have a common theme for each issue? They may revolve around a certain celebrity, political issue, cultural issue or another story that brings each article and photo within the publication together. The reason for this is that it draws the reader into the whole publication. Many organizations make the mistake of putting a bunch of different stories, photos, and numbers into their annual report that, other than they all are about the organization, have no common thread. Your annual report should tell a story from cover to cover – with a beginning, middle and end – showing the reader how they are a part of the story. This should be the first decision you make when beginning your annual report. What story are we telling this year? What area of our ministry or nonprofit are we going to focus on? What thread is going to tie all of the different pieces of this together? Maybe for a Church you choose a family that has been impacted by the ministry in different ways – allowing you to highlight the outreach ministry, children’s ministry, baptisms, volunteer opportunities and wherever else that family may have touched. Maybe it’s the theme of showcasing the future, such as if you are designing a new building or beginning a new program. Each story in the publication shares this common theme. Note that because you have a similar theme, not every story has to be the same – in fact, each story should touch on the central theme but still have its own identity. The cover is the first thing people see, and it should draw them into the story. Don’t simply put “2016 Annual Report” in large letters on the front, instead use it to introduce the central theme that your publication will be revolving around. When many people think of annual reports they think of “cold numbers” and “finances”. While this is true, annual reports should include this information, the report also gives you a chance to turn those numbers into stories. Once you have selected your central theme, find stories that showcase how the investment donors have made that year have impacted lives. Give the numbers names and faces. While it would be great to have the whole annual report feature only stories and photos, many donors do want to see clearly laid out numbers in a traditional format. Be transparent in the income and expenses, as well as the statistics around people served (or whatever else metric you use to track outcomes). Show how these numbers are different than the previous year(s). You don’t have to break this down into line item detail (donors can request this anyway if you are a nonprofit organization). Instead show major categories. It is even better if you can align the financial numbers with the outcome numbers – showing how the program budget for x produced this amount of outcome (Children’s Ministry – $x Number of Children Baptized – x). Another great way to give the numbers is through infographics. Instead of a simple excel sheet turn those numbers into a well designed piece. Many times we find that those who are reading the annual report are inspired to give. We always recommend including a giving envelope inside the annual report that they can send in, and also including ways to give on the annual report. Select a few of your donors to feature “Why I Give” stories. Ask them to share a few brief paragraphs about why they choose to invest in your organization. What inspired them to get involved? Why do they continue to be a part? Why are they passionate about the work you are doing? It’s also great to include a photo of the donors… even better if it is them volunteering with you! We’ve all heard the old adage that a photo is worth a thousand words. Choose photos for your report that reflect the central theme and also accompany the stories. Sprinkle them throughout the report. Often times the annual report, as with most publications, is written by a single person or small team. While this can create an easy system, and make it fast to write a lot of content, it also means that the same voice is going to be heard throughout the stories. Instead, invite guest writers from your staff, team and volunteers to contribute different articles. Once you decide the central theme, select which articles you are going to include. If it is one on a particular program or ministry invite the leader of that area or a member of that team to write the article. Okay, this is a recurring theme in our posts… but having a designer prepare your annual report can return maximum dividends on your investment. Echo Your Story can help you not only decide on a central theme and storyline, but also give you insights on writing content and then design a quality report that reflects your mission and vision. Get in touch today to find out how we can serve you! 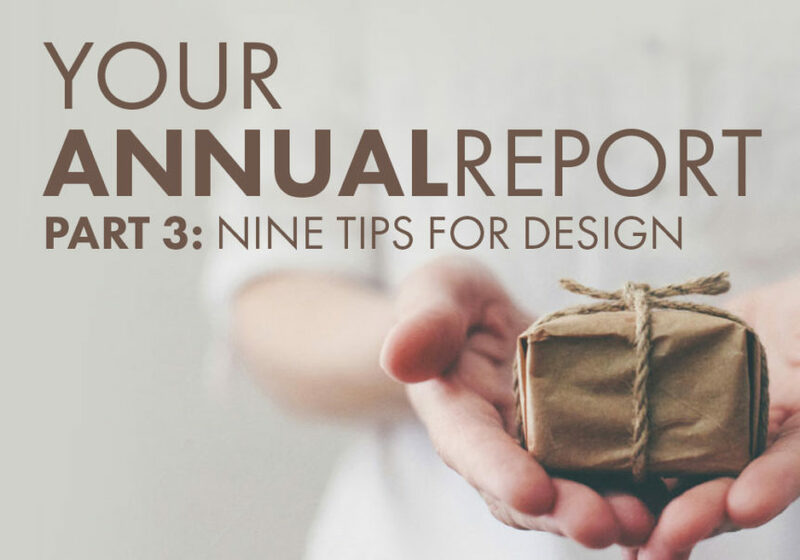 What great tips do you have on Annual Report Design?